GDP grew 6.7% YoY in 2Q, slightly lower than 6.8% in 1Q. 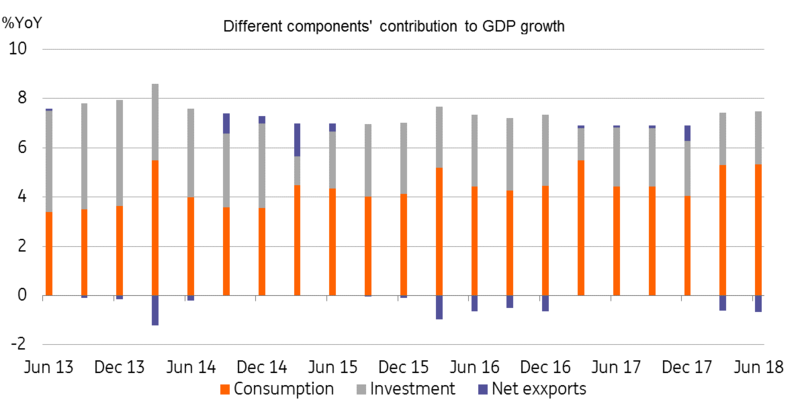 Consumption was still the growth engine, contributing 78.5% of economic growth in 1H18, followed by investment (31.4%) then net exports (-9.9%). Industrial production slowed to 6.0% YoY in June, from 6.8% in May. 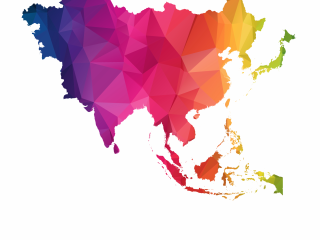 We expect manufacturing in export sectors will slow further as the trade war begins to materially impact the economy. 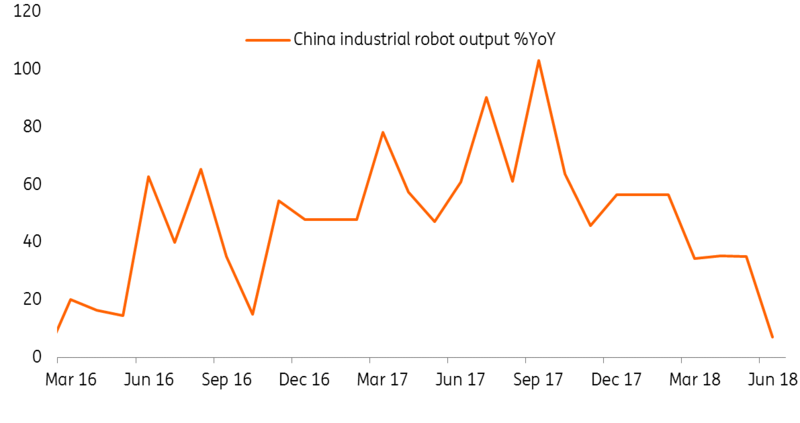 Even robot production grew just 7.2% YoY in June, compared to 23% YoY YTD. This is a significant drop and could be a reflection of over cautious export manufacturers. Investment growth remained at 6.0% YoY in June. Infrastructure investment continued to fall as financing tightened. 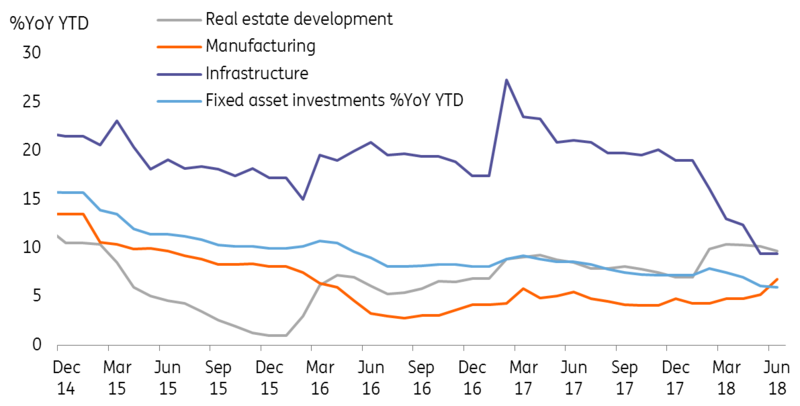 Property investment (9.7% YoY) emerged as the main pillar to support headline investment, while investment in electronics (19.7% YoY YTD) also registered traction. Entertainment-related investment, anchored by strong domestic demand, also grew quickly (17.5% YoY YTD). Retail sales grew faster at 9.0% YoY in June up from 8.5% in May. 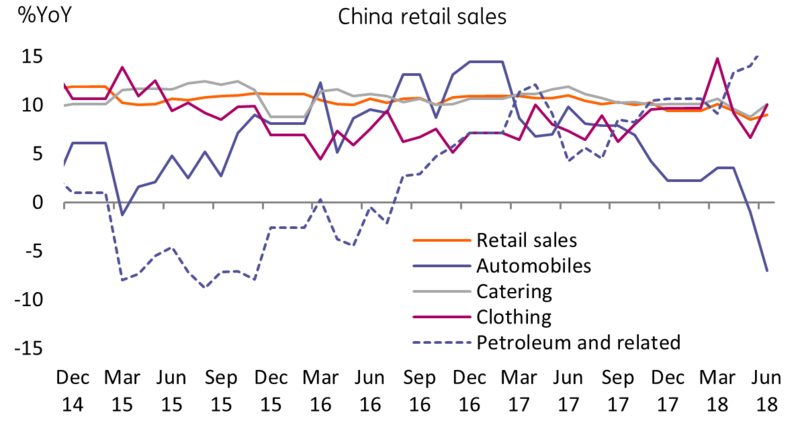 This shows that consumption is slower to react to the trade war compared to the manufacturing sector. The most eye-catching figure is that retail sales of vehicles shrank 7% YoY. Don't over-read this data as consumers are waiting for tariff cuts of non-US vehicles to be reflected in auto prices. Consumption growth depends on salary rises, which in turn depend on business profits. The ongoing trade war will limit profits of exporters, as well as those of supply chain linked participants, including shipping and ports. Though SOEs will be able to absorb labour from the private sector in hard times, wage growth will still likely slow. We believe that fiscal spending on high-tech R&D will increase quickly to offset the loss in investment from exporters. Similarly, reform of salary taxes could boost consumption. Required reserve ratio (RRR) cuts for SMEs will probably continue every quarter. Borrowing costs for SMEs will need to be lower to survive the trade war. 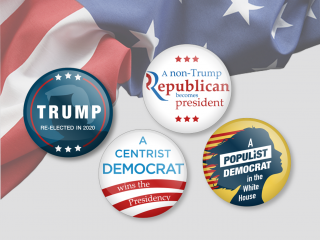 If the trade war does hit the economy hard, then the government will substantially increase investment, especially in high-tech sectors. This will help stabilise economic growth and job security to stave off social unrest. In this instance, the central bank will put financial deleveraging aside to focus on growth. We are revising our GDP growth forecast to 6.6% in 3Q and 6.5% in 4Q from 6.7%, as the drag from trade should be partially offset by policy support.